It is said to have been discovered during the preaching tour of Buddhist monk Kukai (a.k.a. 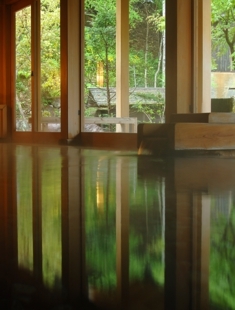 Kobo Daishi) and was named Hoshi No Yu (meaning Hoshi's hot spring). 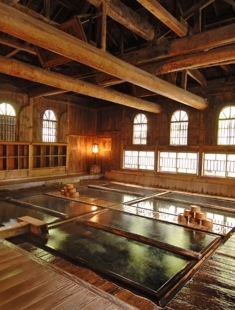 It is one of natural hot springs, which have been decreasing in recent years. Abundant hot water wells up from the bottom of the bath and the water’s beneficial minerals are absorbed into the body without being lost. The spring properties include colorless and transparent calcium, sodium sulfate (gypsum spring) at 43 degrees Celsius, which help cure illnesses and injuries such as a gastrointestinal disorder, burn, and arteriosclerosis. 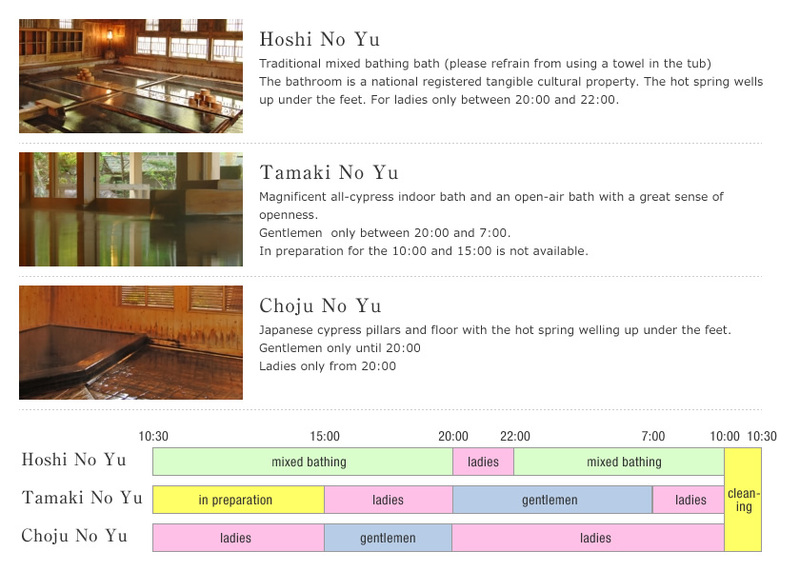 Between 8 p.m. and 10 p.m., the bath is available only to ladies. The large bath, Hoshi No Yu, was the stage of the Full Moon posters in times of then Japanese National Railways. 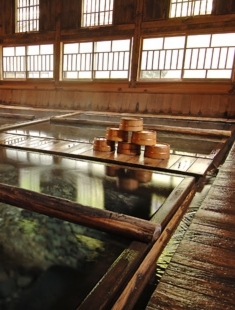 The bath that was constructed more than a century ago preserves its great presence. 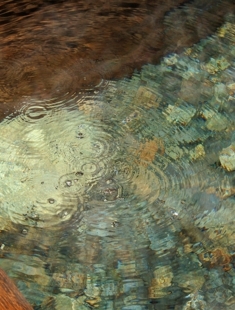 The 100% pure spring water naturally flows out of gaps in the rounded stones filled at the bottom. 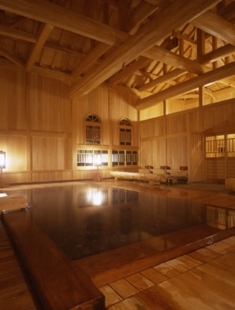 The temperatures of water in the four baths are slightly different. 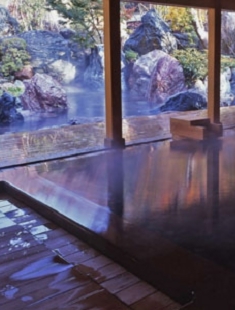 Enjoy the hot spring gushing out below your feet. The changing rooms are separated between men and women, but the baths are shared. People who have known Chojukan for a long time use the boxes around the bathtubs to remove their clothes. 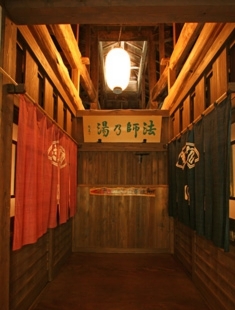 This is, so to speak, the Hoshi Onsen style. Time may seem to pass slowly in this space. Another world opens up beyond the short curtains. 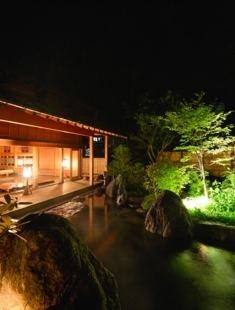 Tamaki No Yu offers an all-cypress bath and a great open-air bath. In response to the request of our female customers who wished to take a longer time to bathe, we started shift-bathing between male and female customers. Ladies bathe between 3 p.m. and 8 p.m. and men bathe between 8 p.m. and 7 a.m. of the following day. 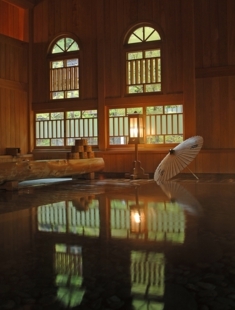 We installed faucets, placed lockers, and created open-air baths that Hoshi No Yu had not have before. 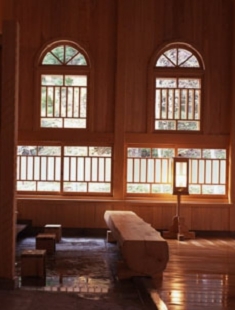 The open-air baths are located outside the glass doors of the indoor baths. Nothing compares to bating while looking up at stars at night. 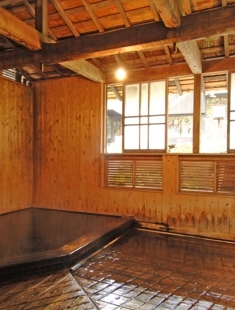 Choju No Yu has received perfect scores in all six criteria for the water source used (source, spring properties, and piping in of water) and bathtubs used (system of supplying and draining hot water, adding water, and rate of adding new water) established by the Natural Hot Spring Examination Association of Japan to measure naturalness and appropriateness. Very clean water is always welling up under the feet. 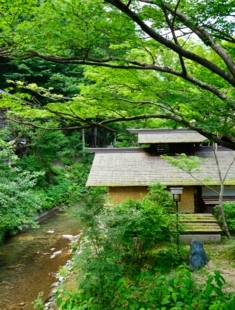 Choju No Yu quietly exists near the river. Copyright 2016 CHOJYUKAN. All Rights Reserved.